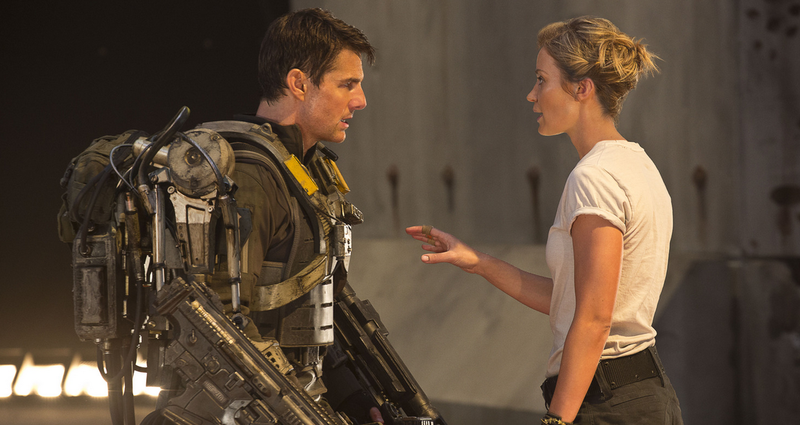 Starring: Tom Cruise (Oblivion), Emily Blunt (Looper), Bill Paxton (Twister) and more. Directed by: Doug Liman (Mr. & Mrs. Smith, The Bourne Identity). Rating: PG-13 for wartime violence, language and massive destruction/mayhem. The biggest comparisons that you may hear about the latest “Tom Cruise” movie will undoubtedly refer to the likes of Groundhog Day, Vantage Point, Source Code and perhaps even Denzel Washington’s lackluster Déjà Vu. 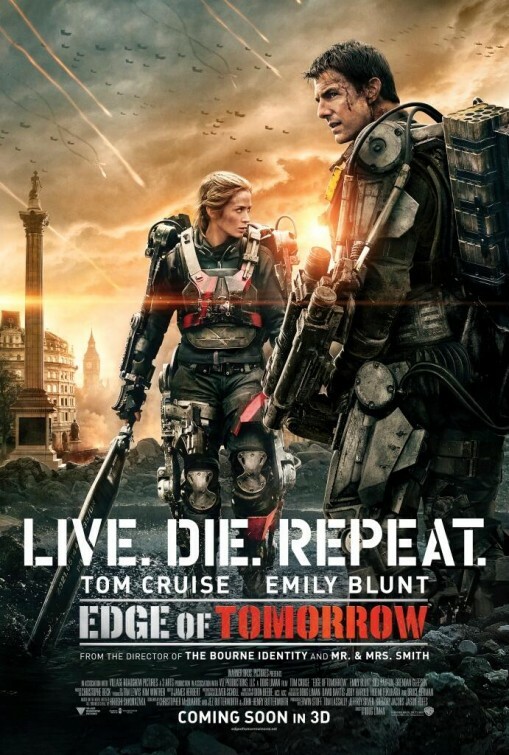 Each of those films merit mention when it comes to Edge of Tomorrow, however, future time loop films now have Edge of Tomorrow to reference as one of the best cinematic uses of time as a plot vice that creates and contributes to the story in great fashion. 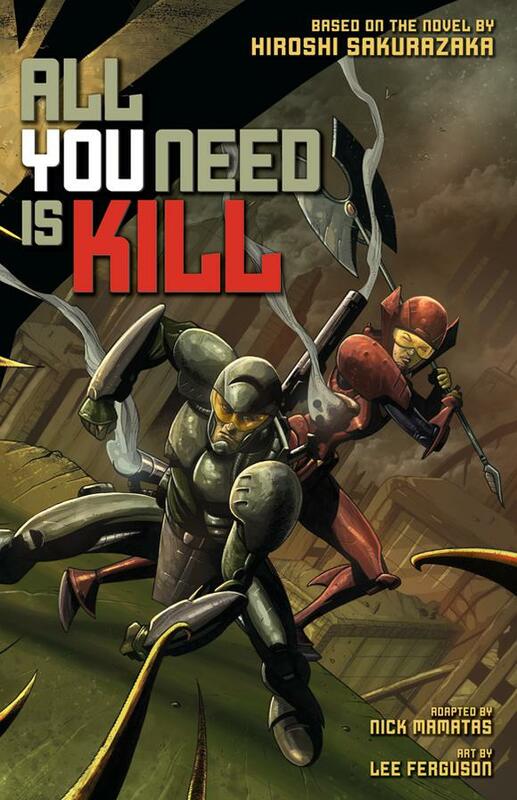 This adaptation of the popular Japanese Manga graphic novel entitled “All You Need Is Kill” (which was the original title of the film) packs everything desired from a blockbuster into one film and intensifies the experience every time the story resets. The idea of a hesitant officer stuck in a time-loop of, understandably, the worst day of his life and forced to proceed through with death as his only certainty may seem the most basic of plots to begin, but the way it develops and keeps old things new and fresh is beyond impressive and entertaining. A lot went into the making of this film. From writing an adaptation that stays truer to the source content than most, to the design of the Elysium-esque suits (of which Tom Cruise himself played a major part), to the wearing of the suits (Blunt cried the first day she had to don the weighty suit), to the acting and more. This story of survival, as Tom and Emily call it in the informative featurette below, combines combat, comedy, characters, cinematography and creative story all in one and it’s just so much fun! This thrilling ride of adrenaline and action plays out like a video game mashed with your favorite anime series nd injected with a blended mixture of Groundhog Day, The Source Code, Ender’s Game and Starship Troopers. I stated to friends of mine who accompanied me to the IMAX 3D showing of it that it is as if this film took a lot of great elements from tons of enjoyable movies and made Edge of Tomorrow. Successfully entertaining, the film may take a few hits from some for the “staple” character types that are typical in films of soldiers. The identifying stereotypes or the acceptable shakycam use, etc. But the film is well-established in and of itself and audiences will have more than one reason to root for the protagonists as the end of humanity is on the line. 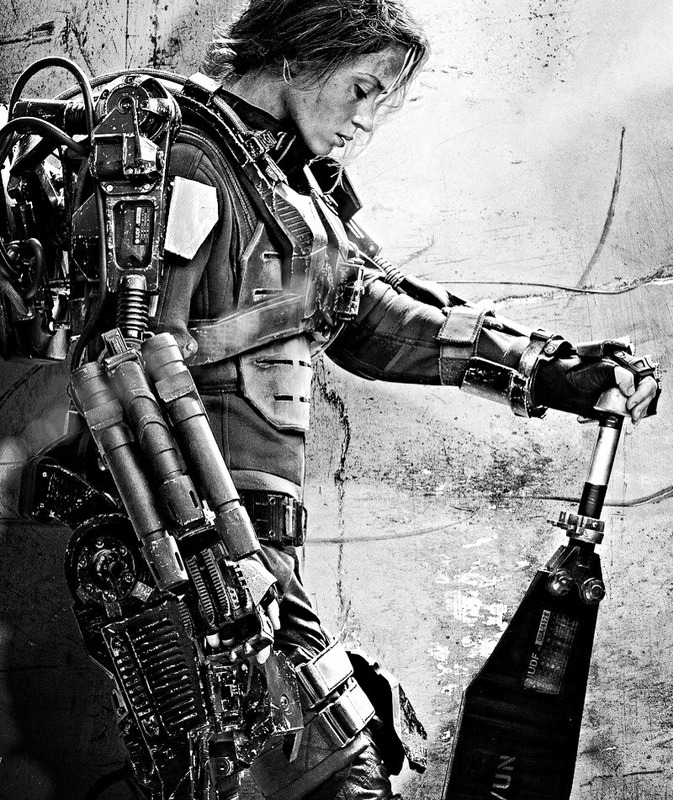 With a strong storyline (that generally follows its set rules of time travel and logic), great action and special effects, thrilling character chemistry, no unnecessary elements, plenty of fitting comedy and an innovative multi-angled view of the sequence of events to prevent boredom Edge of Tomorrow proved to be the right film for today. Fresh, fun and full of fight, do NOT let tomorrow pass you by! It had a gimmick, but it used it well enough to where I didn’t care and just had a blast. Good review T.
it was a blast for sure, Dan! Thanks for reading. How have you been Dan the Man? Agree with the review. its a movie that lets you appreciate Tom Cruise doing Tom Cruisey things. We want to see him knocked down and we want to see him persevere. Its refreshing, energetic and a perfect summer movie with December sensibilities. This movie will resonate like seldom summer movies do. Go see it. hahaha. I’m glad you loved it too! YES! I had an absolute blast watching this one too T, and you’ve hit on all the points I thought of when writing my own review (coming up soon). Glad you liked it, and great review, man! man! I loved this movie and am sad it’s not getting the attention it deserves. So good! Thanks for the comment. I can’t wait to stop by and see your thoughts!